A bottle with which to replenish your existing Alien Eau de Parfum Refillable Spray. Comes complete with funnel to enable pouring with minimum spillage. Mystic, exotic and rich, this fragrance captures the seductress in us all. A unique and sophisticated fragrance that conveys passion, sensuality and the essence of absolute feminity. 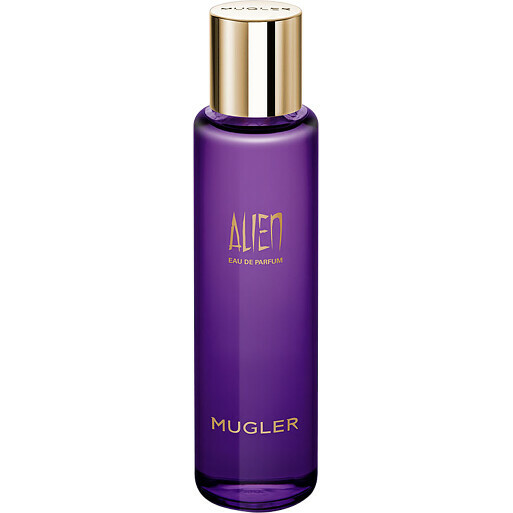 Thierry Mugler Alien Eau de Parfum Eco-Refill Bottle 100ml is rated 4.8 out of 5 by 44. Rated 5 out of 5 by Funkimunki67 from Happy customer! I was initially nervous about using this company as I hadn’t heard of them previously. The price on this perfume which I was after was such a bargain...I thought “Too god to be true?”. I can now say,having received my item plus 2 free gifts within less than 48 hrs of ordering (free delivery too!) that I am a total fan and will be buying all my beauty products from this company from now on! One very happy customer! Rated 5 out of 5 by Vikki1982 from Amazing Scent Thierry Mugler Alien is one of the best smelling perfumes I have ever come across. I have received many compliments on this fragrance from both men and women. My only complaint is that it doesn't come in a bottle big enough to last I seem to go through 3/4 a year, but its worth it!! Rated 5 out of 5 by Davmags from Value for money Bought this as a Christmas gift for my wife as she loves the perfume. She was absolutely delighted when she received this. This is very good value.